A random collage of junk from the Fairview back alleys. Has everyone noticed just how trashy long stretches of Vancouver’s back alleys have become in the last few years? My day-to-day experience is throughout Kitsilano, Fairview, South Vancouver and Mount Pleasant, where the alleys abound, block after block, with an amazing number of abandoned mattresses, box springs, shelves, dressers, upholstered furniture, chairs, tables and lamps, with a sprinkling here and there of fridges and stoves. As well as vacuum cleaners, home electronics, and the odd tub and kitchen sink. When you include the illegal dumping of drywall, and wood from fly-by-night contractors, you might say that Vancouver’s back alleys have all the discarded comforts of home—or rather all the discomforts of home renovation, redecoration and relocation. 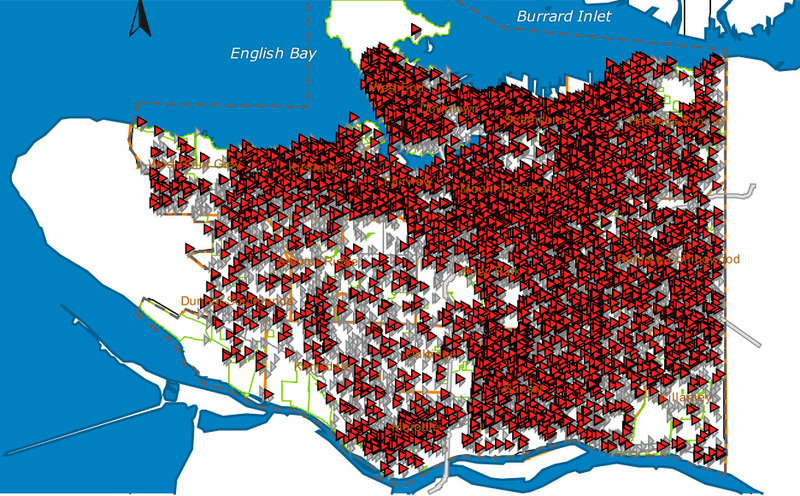 And we Vancouverites appear to have no one to blame for the mess except ourselves, our region and our City Council. A random mattress off West Broadway Avenue and Alder Street. 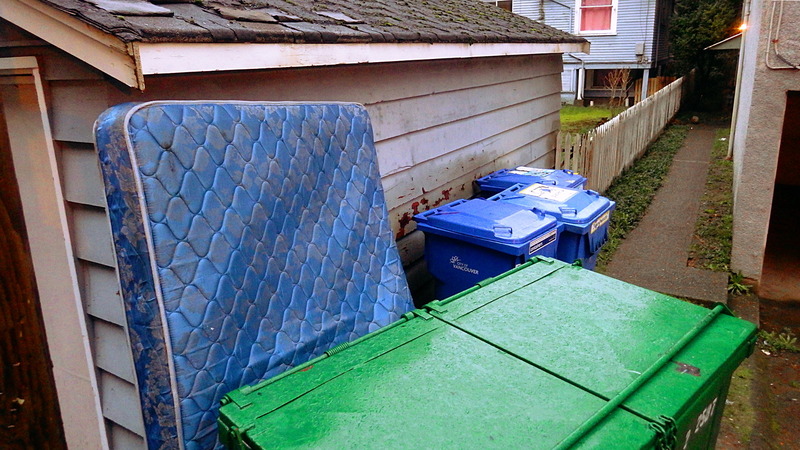 On January 1, 2011, the Metro Vancouver region banned recyclable mattresses and box springs from landfills. The move was expected to result in the ultimate recycling of between 100,000 and 150,000 trashed mattresses a year. At the same time, Metro Vancouver imposed a new regimen of recycling fees—$15 for mattresses or box springs. Five years later, and many Metro Vancouver municipalities, including Burnaby, Surrey, Richmond, Coquitlam and Langley, entitle their residents to call and arrange to have at least four large items of garbage (mattresses, couches, appliances, etc.) picked up and disposed of for free each year. Port Moody and New Westminster provides similar large item pickup but for a fee. “Don’t dump your mattress in an alley or on the street. 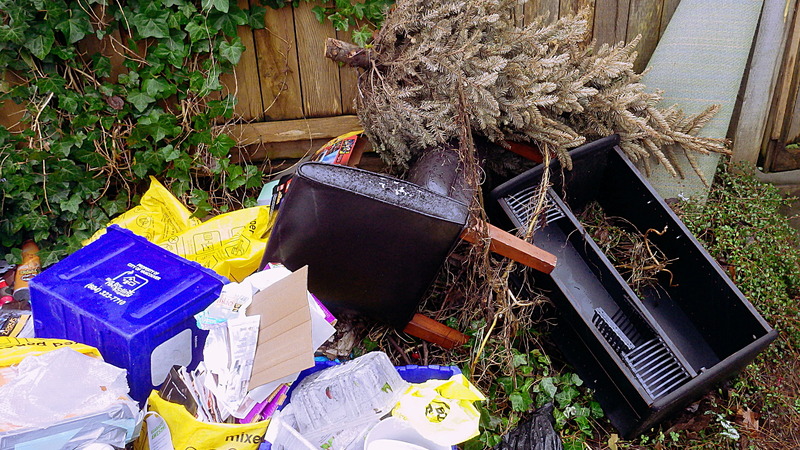 It’s illegal and you could be fined for illegal dumping,” says the City. Instead, the city advises you to recycle your mattress, either by hauling it yourself to the landfill or transfer station and paying the $15 recycling fee ($30 for a mattress and box spring), or by paying a private company to haul it away and/or recycle it. Three mattresses off Oak Street and 12th Avenue. Beyond strapping the mattress to the roof of the car and taking a scenic drive out to either the Vancouver South transfer station on Kent Avenue, or the Vancouver landfill in Delta, Vancouverites have few options and none that are free. Mattress Recycling charges $13 for each mattress dropped off at its Mitchell Island location. The founders of this company helped win the Metro landfill ban and reportedly accept 150 mattresses per day; achieving a 90-100 percent recycling rate, with all recovered materials being used locally. Canadian Mattress Recycling charges $15 for each mattress dropped off at its Annacis Island location. For an additional $70 the company will come to your location in Vancouver and pick up the mattress. Multiple items cost more and fuel surcharges and bridge tolls may raise the cost of pickups in some areas of Metro Vancouver. See the company’s incredibly slow-loading website for convoluted directions and pricing. When buying a new mattress, people are advised to check to see if the seller has a program to pickup and dispose of its products at the end of their useful life. Of course, none of those options seem to appeal to the many Vancouverites who are dumping their mattresses, box springs and other large unwanted items in the back alleys. Time for Abandoned Garbage Action Week, or what? 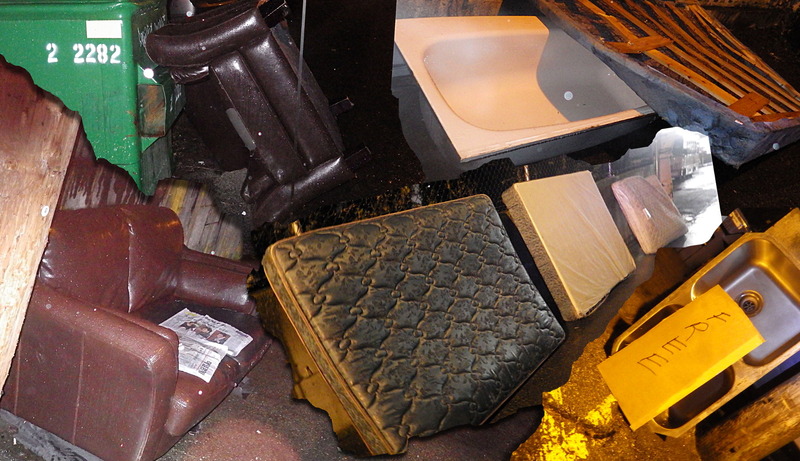 A November 2013 administrative report to the City of Vancouver’s Standing Committee on City Finance and Services states that in 2012 eight percent of the $7,800,000 street cleaning budget, or $624,000, went to collecting and disposing of abandoned waste, including recyclables such as mattresses. The report cites the 2011 region-wide disposal ban on mattresses and $15 recycling fee as factors in the “significant increase in mattresses abandoned on public property, from 2,700 in 2006 to 7,700 in 2012”. It also directly connects the threefold increase of abandoned recyclable waste (from 6,800 in 2006 to 21,500 items in 2012) to the paucity of Return-It recycling depots within city limits. One of the report’s conclusions was that the city should carry out a pilot “big item recycling day”, when residents would be encouraged to drop off their mattresses, electronics and other recyclable materials for handling and removal by the City. Some garbage in Mount Pleasant. At the time of the city report, CBC News quoted Vancouver City Councilor Andrea Reimer as saying that a city-wide clean-up day could take place in the spring of 2014 but if that happened, I missed it. A free disposal day would be good, only as far as it goes, which isn’t very far at all. Simply shortening the distance that people have to haul their large items is no help to those folks who do not have the means to haul a mattress, period. Something that the city has done is create a smartphone app that, among other things, allows residents to report abandoned garbage and illegal dumping on city property. 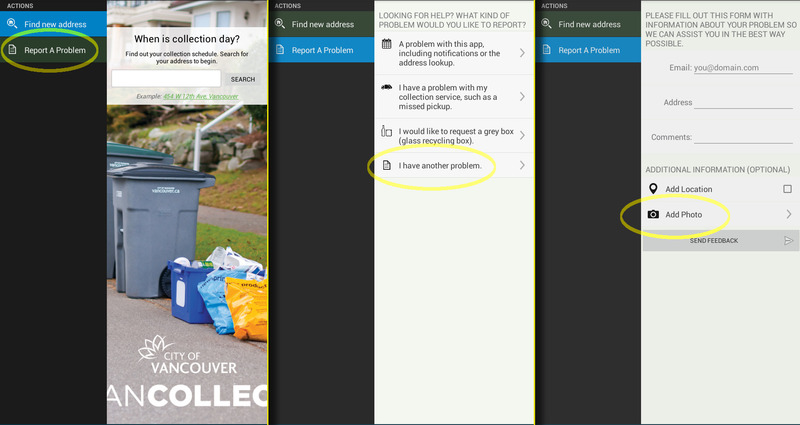 The Abandoned garbage and illegal dumping page has a link to the VanConnect app. However, the link didn’t work on my Android tablet and once I downloaded the app directly from the Google Play store, I couldn’t find the reporting function. Navigating three screens in the VanCollect app to report a problem. Instead, I found it in the city’s VanCollect app. Under “Report a Problem” and the “I have another problem” sub-option, is a form for submitting details of a problem, with the option to add a photo. Now, the way I see it, telling residents, on the one hand, that it’s illegal to leave mattresses and such on public property (a bit of an empty threat) but then encouraging these same residents to report stuff abandoned on public property is only good for creating scofflaws. What’s the city telling its residents? 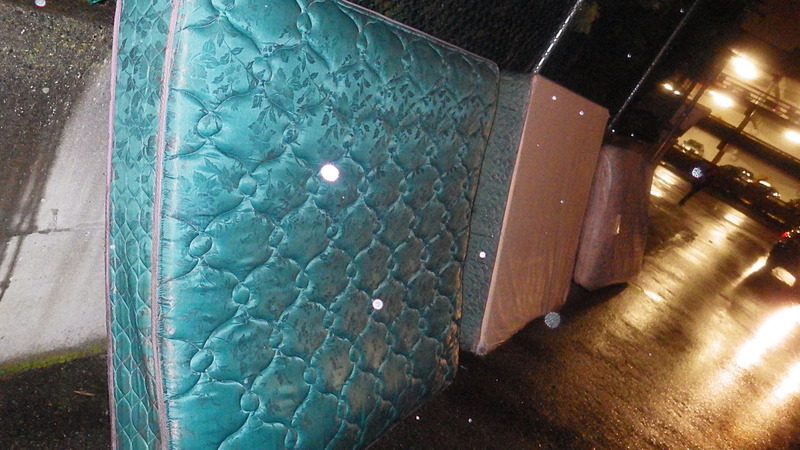 That there’s no free pickup of mattresses…unless they’re illegally dumped on city property. Rather than just holding a single “big item recycling day” once a year (aka, a garbage amnesty), I believe it would make much more sense for Vancouver to at least follow the example of other municipalities, such as Burnaby and Surrey, and give all Vancouver property owners the explicit right to have a certain number of large items of garbage picked up and disposed of by the city for free each year. As things stand now, the current policy of not giving residents a legal way to conveniently dispose of unweildy garbage like mattresses simply encourages illegal dumping and condemns the city to sending crews all over town throughout the year to pick up growing amounts of abandoned garbage at an ever increasing cost to taxpayers. 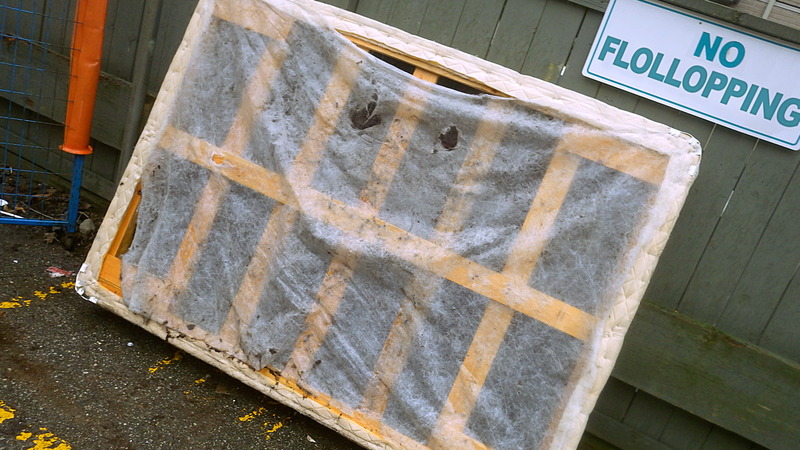 A smug-looking box spring in the alley off Ash and 12th Avenue. Last Thursday morning I stopped to admire one homeless box-spring in the alley of the 600 block on the south side of 12th Avenue. Wheeling around, I saw that I was being addressed by a resident who was disposing of food scraps in their building’s composting bin. “If I had the tools, I might just,” I replied, equably. Turned out that he had taken me for one of the construction workers repairing the envelope of the multi-unit building, against which fence, the derelict box spring was slouching. I explained that I was a binner and pointed to my bike and trailer loaded with bagged returnable containers. The resident immediately turned his attention away from me and rephrasing his question to a real construction worker approaching the outdoor toilet situated near the mattress. “Would,” the worker said, “if it had been put out by our building”. The resident protested that it didn’t belong to his building either. It had been kicking around the east end of the alley for weeks, it seemed—forcibly relocated from time to time like an unwanted squatter. “Well, it’ll continue to,” the worker declared—whether in the spirit of a prediction or a promise, I couldn’t tell—probably both. Click the images to enlarge them. All is mild and nice in Vancouver but in Kitchener, Ont., where this Christian NGO is based, it’s certainly still far, far too cold for homeless people — with an expected overnight low of -18°C Wednesday night/Thursday morning. Brrr-ave homeless people! I collect litter in and around my neighbourhood. (Marpole) I use Twitter and the VanConnect app to report large pieces of garbage,. But this is why I feel plastic bags and disposable cups should be banned. And if I had it my way cigarettes would be banned they also create a lot of waste that is there forever, for lack of a better word. I noted in a followup post how I had overlooked the appropriate blue button for reporting in the Android version of the VanConnect app. Boy I agree with you, especially about the paper cups — especially when McDonald’s does a one week free small coffee promotion! I feel that McD’s and Tim Hortons, etc, should be legislated into creating an extended producer responsibility (EPR) program to encourage/facilitate recycling their cups and other paper waste, in line with the 18 others EPRs in B.C., the best-known being the Encorp Return-It bottle depots, which are run by the bottlers and grocery stores. Cigarette butts are less of a problem in the Fairview neighbourhood but they are still unsightly garbage — if only we could make them edible for crows and seagulls!